Print management is a complex problem. How do you manage printing from every aspect of the business including user’s workstations and critical business back-office applications? Before now, this involved many tools and additional infrastructure. And most of these technologies are built on top of outdated Windows print server technology. A combined solution of PrinterLogic and Plus Technologies solves the end-to-end print management puzzle. PrinterLogic and Plus Technologies’ integrated solution provides a single centralized interface for managing printers across the enterprise while providing powerful output management and still delivering on the promise to eliminate Windows print servers. The solution reduces infrastructure and costs while providing a stable printing environment which simplifies the complexity of end-to-end printing. The integrated solution eliminates the need for a Windows print server. 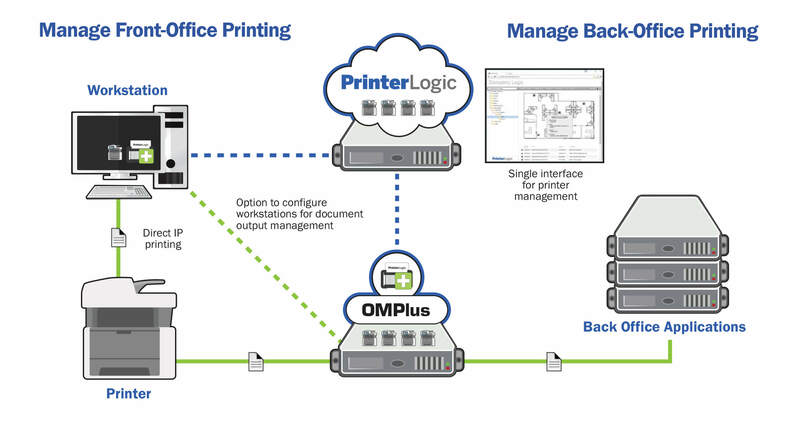 Printing from end-user workstations has the option to be delivered directly to the printer using direct IP or routed through OM Plus Delivery Manager if output management functions are needed. Ensure high availability and provide advanced document output features for ERP and EMR systems by routing print jobs through OM Plus Delivery Manager. The combined PrinterLogic and Plus Technologies solution covers all business applications including end-user workstations and devices as well as back office applications such as EMR, ERP, and WMS, covering a vast array of industries and business systems. What happens when someone prints a duplicate prescription or pick list? Or worse, when documents never make it to the printer or are partially printed? Ensure process is not interrupted and business is not lost with to-the-tray document verification, secure document printing, and intelligent re-routing when printers are unavailable. The combined solution keeps mission critical processes flowing by ensuring printing is available with auto failover and load-balancing, verifying that printing actually happened on the printer, and verifying that if something goes wrong, documents are re-distributed to available printers. Enterprise printer and driver management - Create, configure and manage printers from a single interface for both back-end and front-end printing. Avoid duplicating efforts and human error in managing printers for the different business systems. Provide a self-service portal for end-user printer installation. Confirmation to the tray - Verify that all print jobs made it to the tray for more accurate auditing activities. Troubleshoot any issues with mission-critical application printing. Intelligent rules-based routing - Assess documents in-stream and provide intelligent rules around document types, users, and more to optimally direct print jobs. When printers are unavailable, but printing needs to continue, reroute critical print jobs to available printers. Tamper resistant printing - With patented technology, print tamper resistant documents (prescriptions, checks, etc) using plain paper and existing printers to stop duplication and security issues. Does this blue box get text?